Inspired by trail running packs, the Camelbak Chase Vest has been purpose built for the minimalist mountain biker that still needs to carry essential tools and spares, along with a decent amount of water. It’s a little different to your average mountain bike backpack though, so we gave one to Rachel Sokal to test out over a variety of riding styles to see where it did, and didn’t perform. Over to Rachel! Carrying a little bit more than the bear minimum on a ride can be a bit of a problem. Riders can be reluctant to take a full pack as they can be hot, cumbersome and add extra weigh. 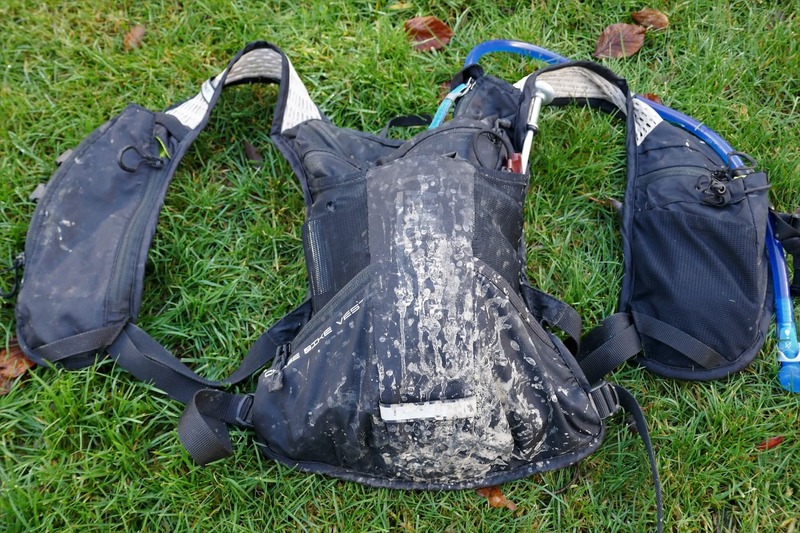 But strapping bits to your bike only goes so far and doesn’t work very well when it comes to hydration, especially given that many trail bikes don’t have the room in the frame to carry a water bottle. The lightweight and close-fitting design of the Camelbak Chase Bike Vest Hydration Pack (in the spirit of keeping this review succinct, herein referred to as the ‘Chase’) aims to overcome these issues. Based on the design of the Camelbak’s running vest it’s designed to maximise storage whilst minimising bulk. The Chase Vest has been adapted from Camelbak’s trail running packs. 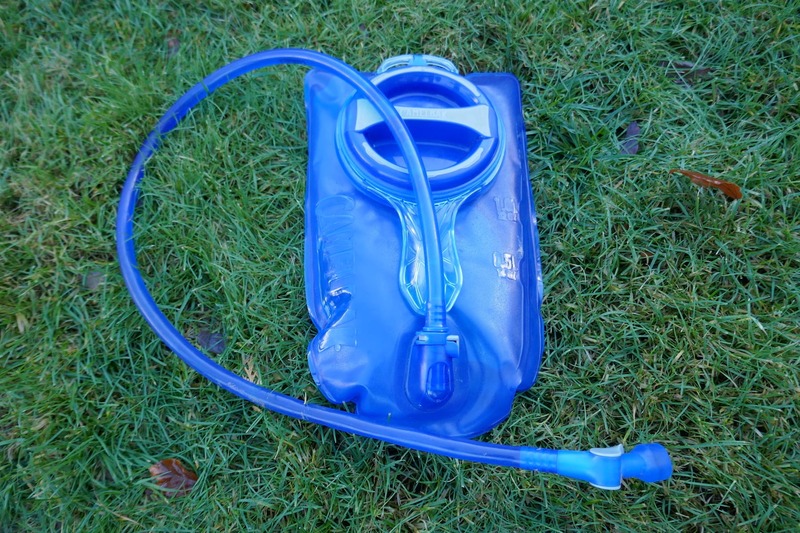 The Camelbak Chase is a four litre pack with a 1.5 litre bladder. 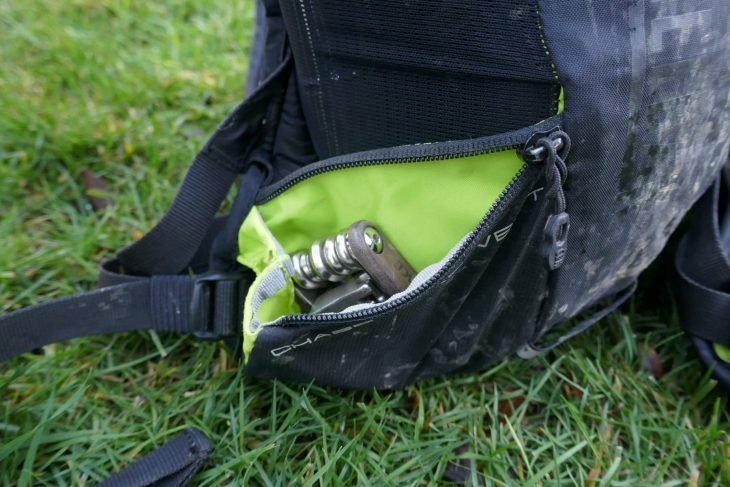 It was originally designed for long hot gravel events but is equally well suited to those enduro and trail riders who want to ride with a light and stable load. There are seven pockets in total which will accommodate your vital tools, spares, snacks and phone. 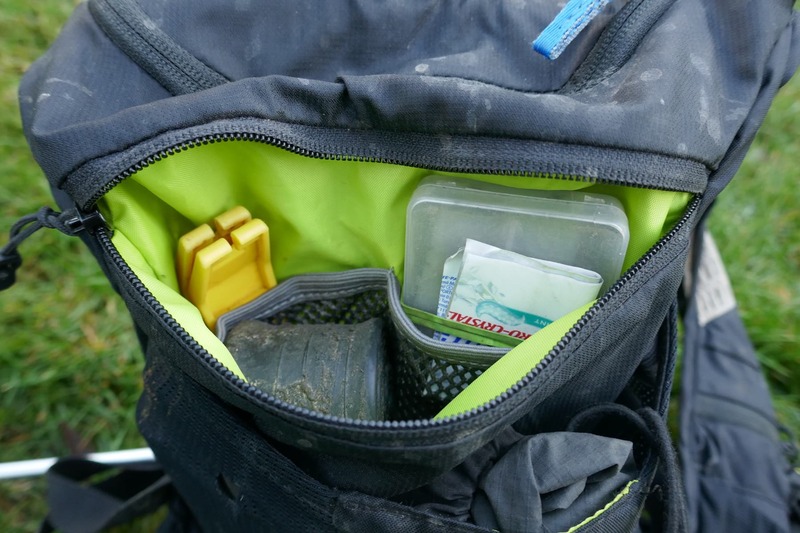 The pockets are really well designed and give loads of flexibility in how you carry your kit. Well-designed pockets are easy to access. Internal mesh dividers for organising tools and spares. 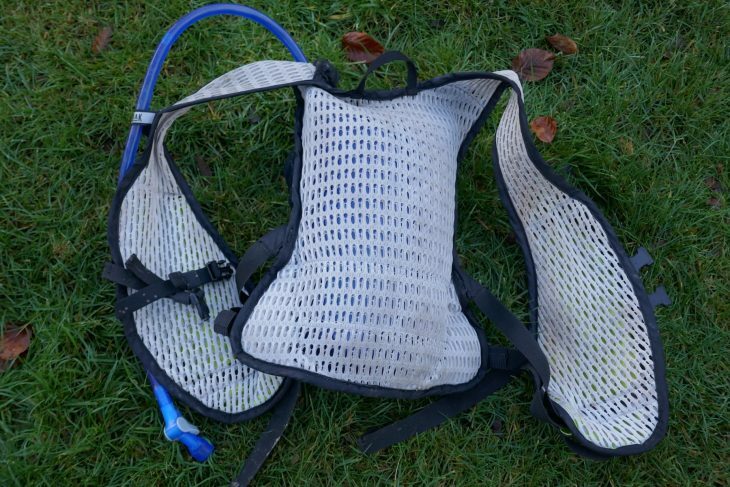 Within the main pocket there are zipped mesh compartments that make it easy to see what’s what, there’s a big meshed pocket on the outside which you can stuff a waterproof into and a few other useful fastenings like loops for a pump and a key hook. The stretchiness of the outer pocket means that it isn’t that tough and as you’ll see from the photos I’ve managed to snag a hole in it. The mesh is well designed though and the tear hasn’t run any further so I’ve not bothered to mend it. 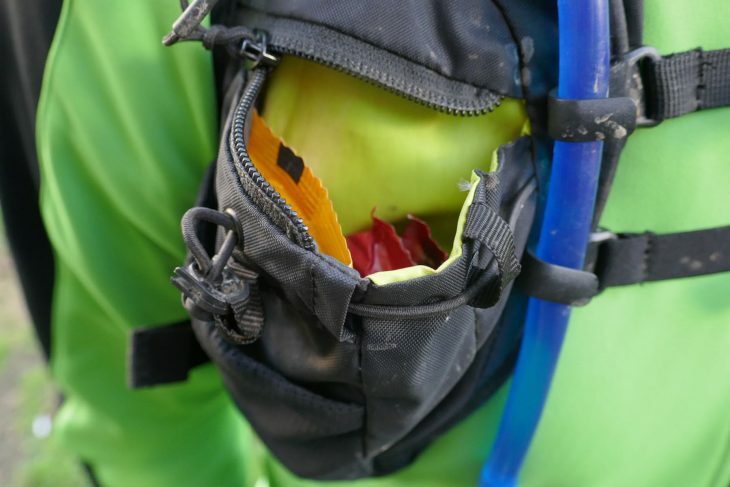 By far the most useful pockets are the ones on the front of each of the shoulder straps which are easy to access on the move and swallow a whole lot of stuff. Designed to accommodate a Camelbak collapsible bottle, they’re also plenty big enough for a smart phone, a small wallet and lots of snacks too. I think every riding backpack should have pockets like these. There are two adjustable sternum straps on the Chase Vest – and that’s it. Those large shoulder pockets are absolutely brilliant, and should be on every pack. 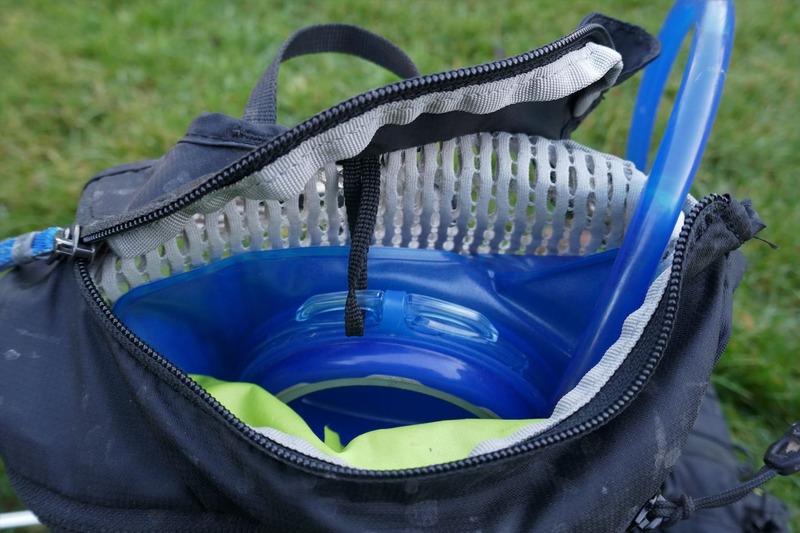 The 1.5 litre bladder sits in the main body of the bag and like all Camelbak bladders has a big opening for easy filling and cleaning. The hose runs over the right shoulder and is held in place by two C-clips (these are only on the right so you can’t switch over to be a left-sided sucker). The wide hose means you get a good flow rate and the bite valve and lock work well to prevent any drips. I did find the hose a bit short, which meant it was easy to kink it if I didn’t take it out the clips before drinking which got a bit irritating at times. 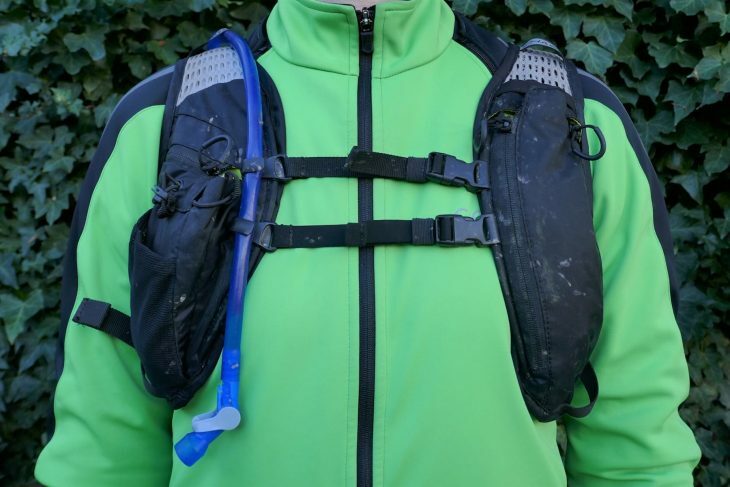 The Chase Vest includes the excellent Crux reservoir. 1.5 litre volume with the best bite valve going. The Chase sits high on your back so you can still access your rear pockets if you’re wearing a traditional jersey. Even though it sits high, it manages to keep well out of the way of the rear of your helmet since the pack is so stable and low profile. The pack is secured by a double chest strap mounted on the incredibly broad and stable shoulder straps. There’s a lot of adjustability via two chest straps and another two at the sides meaning the pack has fitted both a shorter and rounder me and a tall and skinnier Other Half very well. The Chase Vest sits high on your back, but it’s very low profile. The bag is constructed from a ‘3D vent mesh’ to keep air circulating as much as possible. This seems to work reasonably well but the fact that the pack is so well fitting means that air flow is limited. Despite this I’ve comfortably worn it on some hot days this summer including when racing in the south of Europe and it didn’t overly bother me. I think the fact that only half your back is covered helps but also I don’t tend to get fussed about a sweaty back. As the mesh is quite lightweight it does look like it could be quite vulnerable to scuffs and scrapes but as yet hasn’t shown many signs of wear. The thin and wide mesh harness helps to keep this pack super stable. 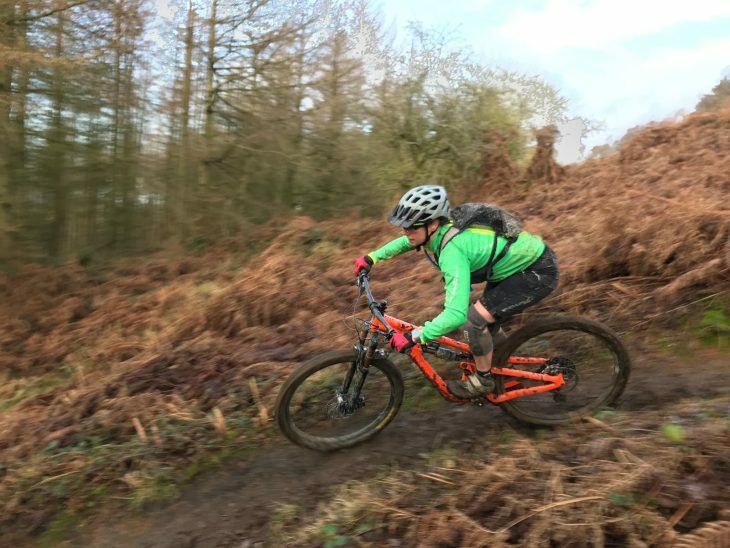 I’ve used the Chase on lots of different types of rides from local blasts, to enduro stage racing to long XC jaunts and it’s been great on all of them. 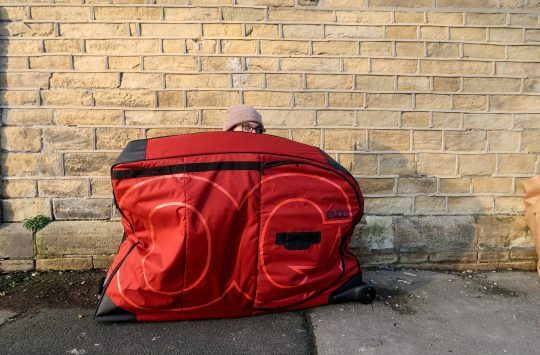 I wouldn’t normally take a pack on a quick local ride, instead preferring to just stuff things in my jersey or jacket pockets with a bottle or two on my bike. The Chase doesn’t hold much more than this but it makes getting out a lot quicker, and my stuff is far more secure (I haven’t yet lost my phone or door key out my rear pocket but it’s only a matter of time). Mesh helps with sweat dispersion, but there still isn’t heaps of airflow. For longer XC rides I’ve used it to double up on the capacity that my pockets and water bottles can store and so have been able to stay out longer without needing a full pack. But where I’ve found the Chase to be at its best is for enduro racing as it’s so much more stable than a larger pack and doesn’t carry the risk (boom-tish!) of strapping things to your bike. 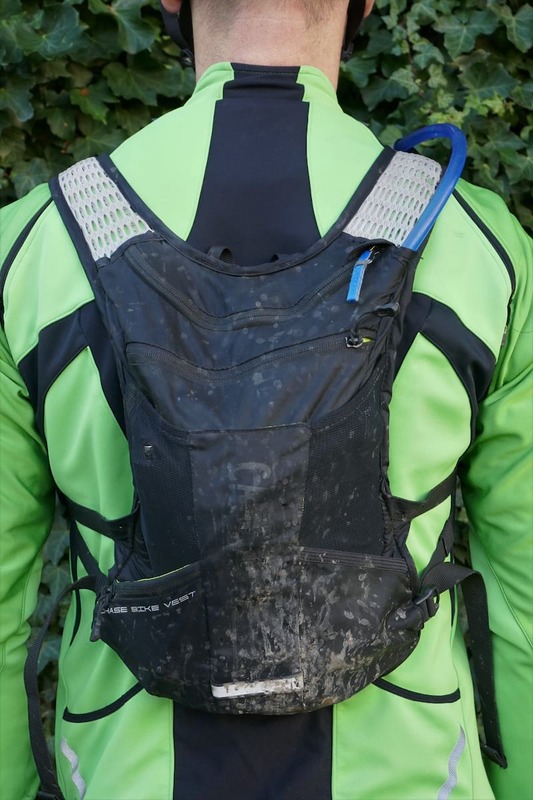 The Camelbak Chase is a neat and well-fitting pack that keeps your essential kit safe and stable whilst you’re tapping out the miles or hooning it down an enduro stage. The pockets are well designed to give lots of flexibility in how you store your stuff and there’s an excellent flow rate from the bladder. 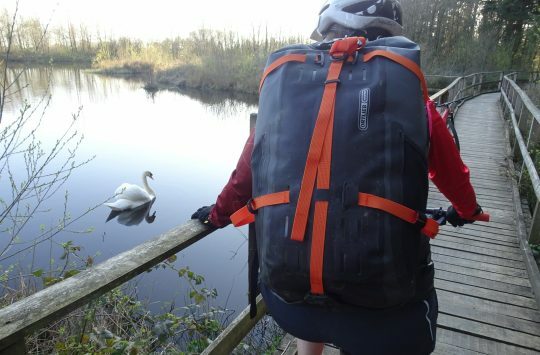 No, this isn’t a burly, carry-everything-all-day-long trail pack, but for sub-2 hour rides and long distance racing, it is a very practical and comfortable option. Cambelbak are still owned by Vista Outdoor (NRA supporters). It may not be important to many but for some still a consideration. Camelbak and the NRA. Supoorting shooting your friends, neighbours and other innocent people since 1774.
ive had one of these for quite a while and use it for most short rides, gravel events and running. The only issue is that due to the mesh back covering, the water in the bladder does warm up quite a bit.